What is a law library? Law libraries are designed to provide information and forms for persons who are representing themselves in court. The information is intended to help you help yourself through the court system. What services do law libraries offer? Law libraries provide legal information, forms, services, and procedural information for self-represented litigants. Certain locations offer workshops, also known as legal talks, that discuss topics such as divorce, eviction, and court procedures. Services vary by location, so be sure to contact a law library for more information. Do I have to have a library card to use a law library? No, law libraries do not require you to enroll or create a membership. Where is the law library nearest me? To find the nearest law library, click here. How do I get a lawyer for free or at least at a reduced fee? There are programs out that that can help you if you qualify. Qualifications are based upon income, family size, case type, military history, and citizenship. To see if you qualify visit AZLawHelp.org. 3.a. Navajo County Court House. 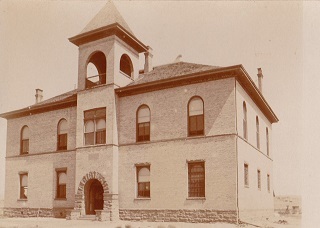 Navajo County Historical Society. 1913-14.